Biologists working in the tropical rainforest discover and study different plants and animals. They also work to make sure the plants and animals survive in the rainforest. "I am a forest canopy biologist and I work to conserve forests around the world. I use Google Earth images and ropes plus climbing hardware to help save remote tropical forests, where people do not have electricity or mobile phones or other technology. These places are really important for providing fresh water and honey and medicines from the treetops, so it is important to save them." 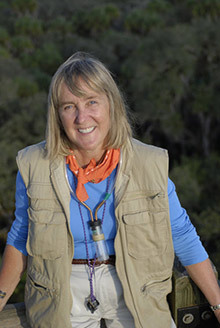 — Meg Lowman, Ph.D, Senior Scientist and Director at the North Carolina Museum of Natural Sciences.